Discography is an examination of a disc using a contrast agent. It should not be confused with a myelography because, during myelography, a contrast agent is injected into the space around the spinal cord. How is discography carried out? 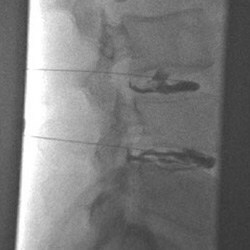 During discography, the contrast agent is sterilely injected into the disc through a very small needle, under CT- or X-ray-guidance in an operating room. In addition to the administration of a contrast agent and the analysis of the images, there is a pressure test with a special manometer, which measures if a disc is abnormally sensitive to pain. Based on this information, physicians can detect the disc, which is pathologically degenerated. 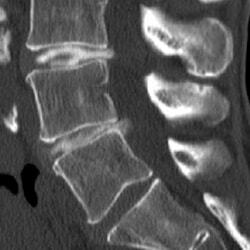 The upper X-ray image shows a discography of a herniated disc with a leakage of a contrast agent into the spinal canal (lower disc). The contrast agent is injected through fine needles. It is visible as a dark/black fluid. The lower CT image shows a reconstructed spine for the better evaluation of even small tears of a vertebral disc. The contrast agent is visible as a bright/white liquid. Discography can be carried out, if a tear in a disc is expected, which could not be proven by an MRI examination.